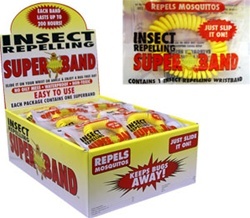 The Insect Repelling SuperBand, repels mosquitoes, bees, flies, gnats, yellow jackets, and many other annoying flying pests. The waterproof and non-toxic SuperBand does not activate until the pachage is opened. Once opened, they are efective for up to 200 hours! With the EPA recently recently banning certain chemical repellents, the SuperBand and its family of products have become the solution to toxic, greasy lotions and sprays. These reliable products are simply the best natural insect repellents available! Economical, effective and easy to use products that employ state of the art technology to protect your customers. Average Customer Review: 4.5 of 5 Total Reviews: 2 Write a review to tell others what you think about this item. Haven't tried this product myself, but it comes in a single packed plastic cover. It would be nicer if there was a hole in the plastic to hang them on a hook on the slatwall, but now I put them all in a box (which is also good).